Every year, thousands of people experience out-of-hospital cardiac arrests, however the survival rate is only one in ten. 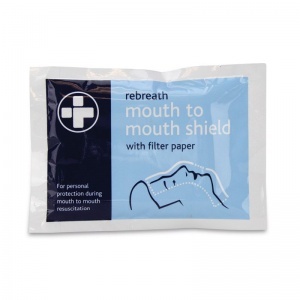 CPR can be a potentially lifesaving procedure, and the Rebreath Resuscitation Shield with Filter Paper ensures that you stay protected while performing it. The shield takes form of a plastic film with perforated filter paper to act as a barrier to prevent infection when making mouth-to-mouth contact. Cardiopulmonary resuscitation (CPR) is an emergency procedure where a person performs chest compressions and gives a casualty a series of rescue breaths to help save their life when they are in cardiac arrest. Without CPR, a person suffering from cardiac arrest will die within minutes, as the heart stops pumping blood around the body and brain. The Rebreath Resuscitation Shield is a transparent plastic film that is printed with an illustration of the face, in order to indicate where the device should be placed on the patient and eliminate any doubt. In the centre of the plastic film is a perforated paper filter for protected mouth-to-mouth contact so that rescue breaths can be performed effectively. The mask is primarily used for the mouth-to-mouth ventilation of a non-breathing adult. Available to bulk buy as a pack of 10 Resuscitation Shields. they can be kept in any comprehensive first aid kit so that you are ready in the event of an emergency situation. Feel safe in the knowledge that you will also be protected from any infection or bacteria while performing a lifesaving procedure. 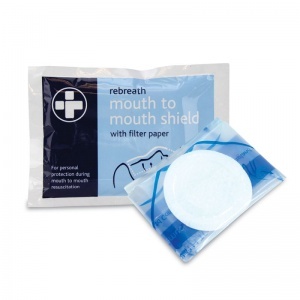 The Rebreath Resuscitation Shield with Filter Paper is usually dispatched via First Class Royal Mail and delivery should be within 1 to 3 working days.